« InforSERB MOT and Service feature! The Nissan Note shares some similarities and characteristics with the Renault Modus and the Renault Scenic. The Note shares a platform with the former and engines with both. The Note provides the practicality of a compact MPV yet sports the good looks and feel of a hatchback. The Note’s exterior design won’t appeal to everyone. In its attempt to make a totally unique design the firm borrowed from many sources and the end result is a unique car that may not seem totally cohesive to everyone. One of the big selling points for the Note is the fact that it’s bigger than a Fiesta but smaller than a Focus. The car is fairly conventional but the unique size being offered is catching the attention of buyers.The Note is similat to a supermini but has characteristics of an MPV. Entry-level S models are under-equipped. The mid-range SE is the best choice for value and comfort. The small 1.4-litre petrol engine is the best choice being offered, and it feels lively and responsive, yet provides smooth high-speed cruising. The diesel choice provides better fuel economy and may be the most practical choice. The Note was designed to be a family car so it’s inexpensive, given of course that the cheaper models are a bit on the ugly side. Maintenance and insurance rates will be low, making the Note slightly more attractive. Once inside the Note, you are assured that this was built for a family. Head and legroom are both sufficient, in the front as well as in the rear. The boot is a generous size and will be large enough to carry a few larger items. The controls and gauges are all functional, but have a cheap feel and are unattractive. The gauges aren’t well located, and the driver will have to look down to see the speedometer. The fascia is, however uncluttered and functional. The front seats are on the soft side, and fabric may begin to sag. The rear seat is capable of seating three, but only two will fit comfortably. The rear seats are more firm, but could be more supportive. Gaining access into the cabin of the Note is easy both for front and rear passengers. The seats slide making it possible to increase legroom, though this will only be required for large adults. The lid to the boot doesn’t open as wide as would be expected, and the boot itself sits high. At low speeds the steering becomes light and agile. This is helpful due to the fact that visibility is reduced, thanks to the rear pillars. This shouldn’t pose a problem as the Note isn’t too wide. The 1.4-litre version is the best choice. The note drives well in comparison to rival brands. Steering is unexceptional, and the Note seems happiest cruising along at motorway speeds. The note is designed for families but is also a budget buy. The Note will not accommodate larger children well, and buyers may want to consider a used vehicle from the class up. The Note could easily be used as a first car. The Note’s size may not make it as inexpensive fuel wise but otherwise it could make a very practical first car. The car should be reliable and insurance rates should be reasonable. The Note is built in theUKand the cabin quality is very good. The few cabin imperfections are hidden quite well with the abundance of black. 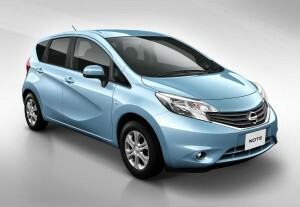 Nissan’s Note shouldn’t have any problem creating a loyal following. The Note comes standard with an engine immobiliser, central locking and keyless entry. The car boasts an intelligent key system as a cost option. The car comes equipped with four airbags. There are two at the front for the driver and passenger plus thorax side airbags mounted in the front seats. SE and SVE models receive curtain airbags for front and rear. The car features a radio/CD unit. The system is a single disc player with four speakers. SE models get six speakers. Only SE and SVE models have steering wheel mounted controls for the driver’s convenience. There are ten body colours available. S models are not well-equipped and customers will probably opt for the SE or above for items such as extra airbags, alloy wheels, the split level luggage floor, and foldaway tray tables. The Note is a smaller car but has good interior space and can be used for many practical purposes. The Note’s exterior is fresh but not too radical. Buyers will appreciate the practicality the Note has to offer and the price. This entry was posted on Wednesday, January 3rd, 2018 at 12:30 pm	and is filed under Uncategorized. You can follow any responses to this entry through the RSS 2.0 feed. Responses are currently closed, but you can trackback from your own site.